The Accidental Locavore thinks Farmer Paul’s strawberries have been so good, they don’t need messing with. When I’m not just munching them out of the box, the locavore has been eating them sliced over yogurt in the morning and sliced over vanilla ice cream for dessert. Grill them. Either cut them in half and put in a lightly oiled grilling pan, or skewer them and brush with a light vegetable oil. Grill over medium heat until grill marks start to show and the berries are warm, about 5 minutes. 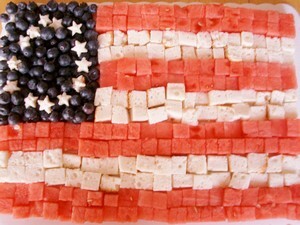 Serve with ice cream or Greek style yogurt. Make your own crème fraiche, it’s super easy. In a glass container mix together: 1 cup of heavy cream and 2 tablespoons buttermilk. Cover (a dishtowel is fine) and let stand on the counter overnight (or up to 24 hours). When it’s fairly thick, refrigerate until ready to serve. It will thicken up when chilled. 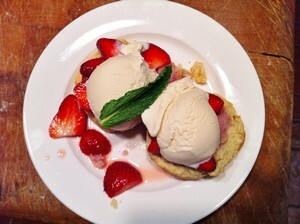 Try strawberry shortcake with buttermilk biscuits and use vanilla ice cream instead of whipped cream. 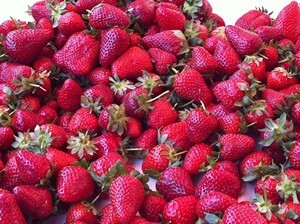 Slice the berries and toss with a tablespoon or two of sugar to release their juices.